Wood carving – an activity that is practical, calming, skilful and quite often entertaining all at the same time. I recently had the privilege of spending a day improving my carving ability whilst on the Carving Master Class with Ray Mears, a course bought for me (as I expect many people’s courses are) by my wife. A stroll down into the woods with a course assistant brought us to a clearing with Ray already hard at work splitting a large sweet chestnut log into foot and a half long planks. Logs for seats, the trusty old camp kettle suspended over a open fire and a beautiful sunny day – what could be better! Having attended a couple of the other Woodlore courses, including the Fundamental Bushcraft, I had at least a small amount of carving experience. However, looking back at my first attempts and post course work, it was quickly obvious that the majority of my past efforts seemed to bear more resemblance to a miniature caveman’s club, than the finely carved, decorated and finished ladles, spoons, bread boards and drinking cups that Ray had on display. I had a lot to learn! After introductions, the first part of the course focused on the tools we would use for carving, primarily axe and knife, and how to sharpen them effectively both at home and in the field. 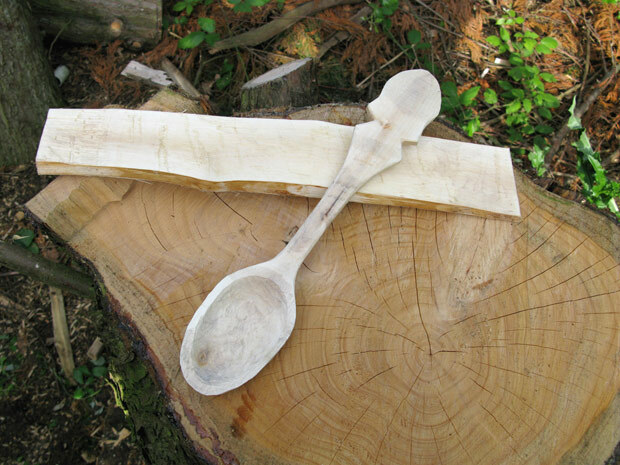 After Ray had, in short order, selected, split and axed out a roughly spoon shaped object, it was our turn to select our ‘blank’, the length of timber from which we would eventually summon forth our spoons. The first moments of hilarity arrived with people choosing a variety of timber sections ranging from a few inches in diameter and roughly smooth to a good six to eight inches of knobbly rough looking log. As a testament to Ray and his team of skilled instructors and assistants, all managed to split their log and begin carving. Everyone was encouraged to proceed at their own pace and Ray stopped and frequently showed us all the next steps in the process – thinning down, shaping and decorating. Ultimately, myself and the rest of the day’s participants followed Ray’s expert guidance and tuition, eventually roughing out a spoon shaped object from our original split log to a stage where it could be taken home to be sanded and decorated. The day as a whole was thoroughly enjoyable and I would highly recommend it to anyone regardless of experience. For me, more carving, of a variety of items and styles, is now firmly on the horizon. 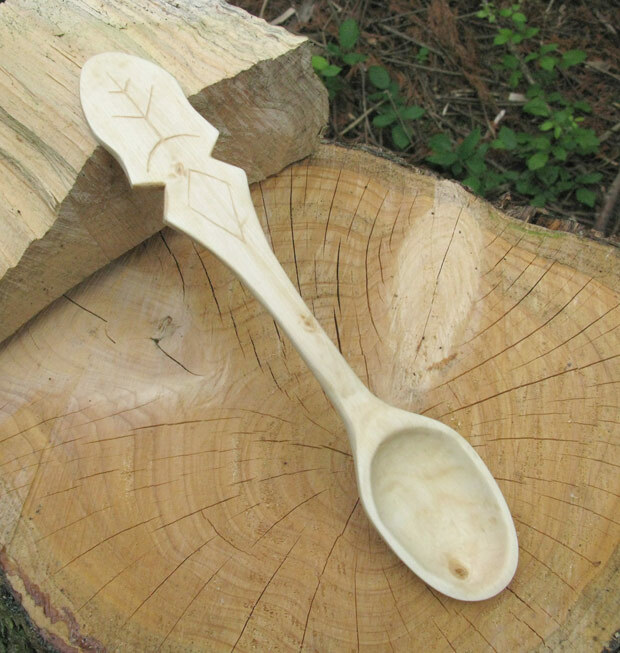 This entry was posted in Bushcraft Courses & Expeditions, Customer Posts and tagged axe, Carving, knife, Master Class, Ray Mears, saw, spoon, whittle, woodland, woodlore on May 20, 2016 by Woodlore Limited.